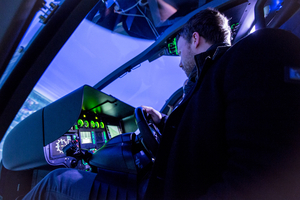 The helicopter simulator of the AVES simulator center was used for ground-based simulation and preparation of FHS flight tests. Like in the real helicopter the cockpit was equipped with steering wheel and highway-in-the-sky display. The flight dynamics of a future PAV were simulated and the guests could take a flight.